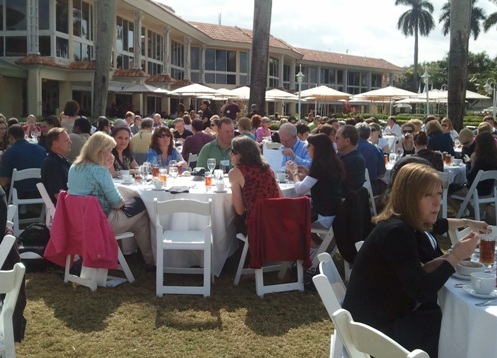 The 2011 EBMA Annual Meeting was held on January 18-21, 2011 at the Doral Golf Resort in Miami, Florida. The meeting attracted over 120 Publisher Members and 45 Wholesaler Members. The theme for the 2011 meeting was Motivating Children to Read in the 21st Century: How High-Interest Novels, Technology, and New Education Policy Can Lead to Successful Readers in Our Schools. Over the three days, publisher and wholesalers met over one-on-one sessions which are designed to faciliate business discussions. The one-on-one sessions have proven to be invaluable to our membership. One wholesaler said about the one-on-one sessions, "Getting the word about new marketing, new initiatives, etc. to over 70 publishers at one = PRICELESS." On the opening night, members enjoyed a cocktail reception, dinner and an award presentation that included the 32nd Ludington Award Presentation to Steven Kellogg. Steven is the author and illustrator of over 100 books for children including the Pinkerton series, The Island of the Skog and a series of American tall tales, including Paul Bunyan and Johnny Appleseed. To learn more about the Ludington Award, Steven Kellogg or past receipients, click here. Patrick Carman, author of Skelton Creek, Trackers, and The 39 Clues. Courtesy of Scholastic. James Patterson, author of the young adult series' Maximum Ride and Daniel X. Courtesy of Little Brown Books for Young Readers/Hachette Book Group. In addition to these presentations, Dan Walsh, president of EBMA, updated the membership on EBMA business and introduced the new EBMA Executive Director and Management Company, Brian Gorg from the Collie Gorg Group. The 2011 Annual Meeting was deemed a success, members learned a bit, got business done, and had fun in the process.